The Mystery of Peter Lebeck and the X Bear. Heritage Junction Dispatch, Vol. 35 No. 5 | September-October 2009. It might never happen again in this area. But how do we know this, and who was this Lebeck fellow? Truth is, we don't really know who he was, nor even how he spelled his name. It could have been Lebeck, Labeck, Lebecque or Lebec. There has been much historical speculation about Lebeck and what he was doing in this area that led to his violent death in 1837. 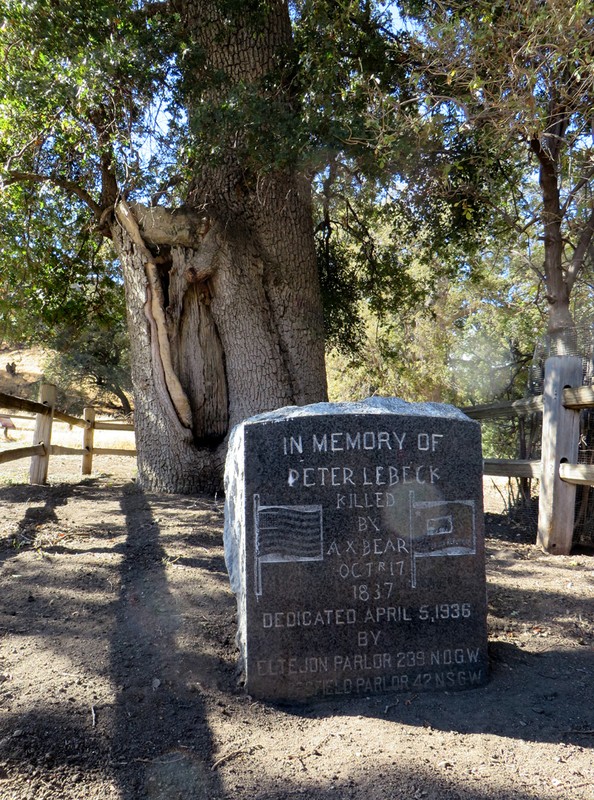 An inscription in the bark of an old oak tree at Fort Tejon is about all we really know of Peter Lebeck. This is half of the inscription; click the image to enlarge it and see the other half. One thing we do know for sure is the date this man died. We know because of an inscription left on an oak tree on the grounds of Fort Tejon which states, "IHS [+] PETER LEBECK KILLED BY A x BEAR OCTR 17 1837." According to the 1954 book, "The Life and Death of Peter Lebec" by Raymund F. Wood, the first person mentioned in historical records to have visited the inscription was an unidentified man who happened upon the oak tree in 1842. He is mentioned in an article from July 11, 1874, in the Bakersfield newspaper, Kern County Weekly Courier. The grave of Lebeck and the inscription are also mentioned in the diaries of three members of the Mormon Battalion, a group of volunteers who passed through the area in July 1847 on their way to Sacramento and back to Utah after coming to California the previous year to fight in the Mexican War under Gen. Stephen Watts Kearny. They arrived in California too late to fight in the war but helped out with the occupation efforts after the war's end. One of the diarists, Henry W. Bigler, mentioned finding the Lebeck inscription and reported: "Near by was the skull and bleached bones of a grizzly bear." The next mention of the Lebeck inscription is found in Volume V of the Pacific Railroad Surveys, titled "Reports of Explorations and Surveys, to ascertain the most practicable and economical route for a railroad from the Mississippi River to the Pacific Ocean, made under the direction of the Secretary of War, in 1853-4." It was published in 1856. 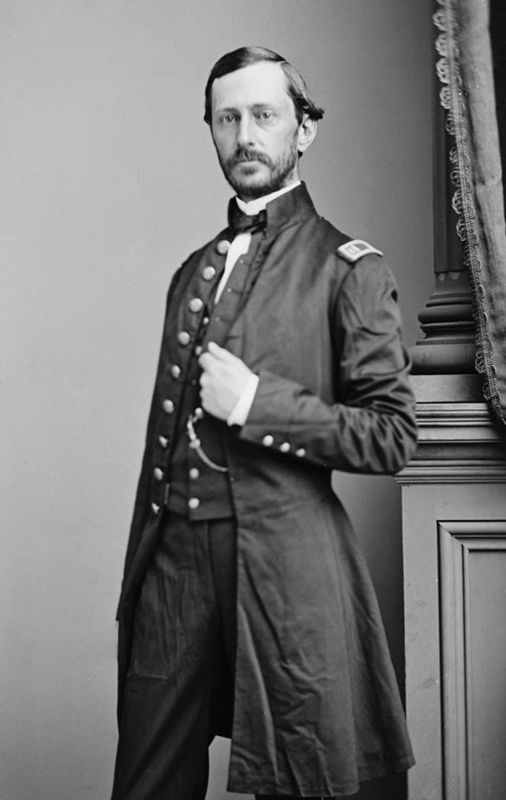 Lt. Robert S.Williamson was leading a government expedition and passed through the Santa Clarita Valley in 1853 as part of the effort to find a practical route for a transcontinental railroad. In the book, Lt. William P. Blake, a geologist and mineralogist for the expedition, mentions an encampment near the Lebeck oak tree on Sept. 29, 1853. He noted an unusually large number of grizzly bears in the area. A party led by Lt. Edward Fitzgerald Beale (commissioner of Indian Affairs at the time) found the Lebeck tree June 5, 1854. William A.Wallace, a member of Beale's party and editor of the Los Angeles Star newspaper, wrote about the oak tree and its Lebeck inscription. Fort Tejon was constructed in 1854 with the Lebeck oak winding up on the north corner of the parade ground. The Fort was closed down in 1864 and fell into disrepair. By 1890 the tree bark had grown over and covered the Lebeck inscription. A group called the Foxtail Rangers from Bakersfield was encouraged by Edward F. Beale to find the body of Peter Lebeck. They indeed found his body next to the old oak tree and reburied him and accurately marked the grave site. 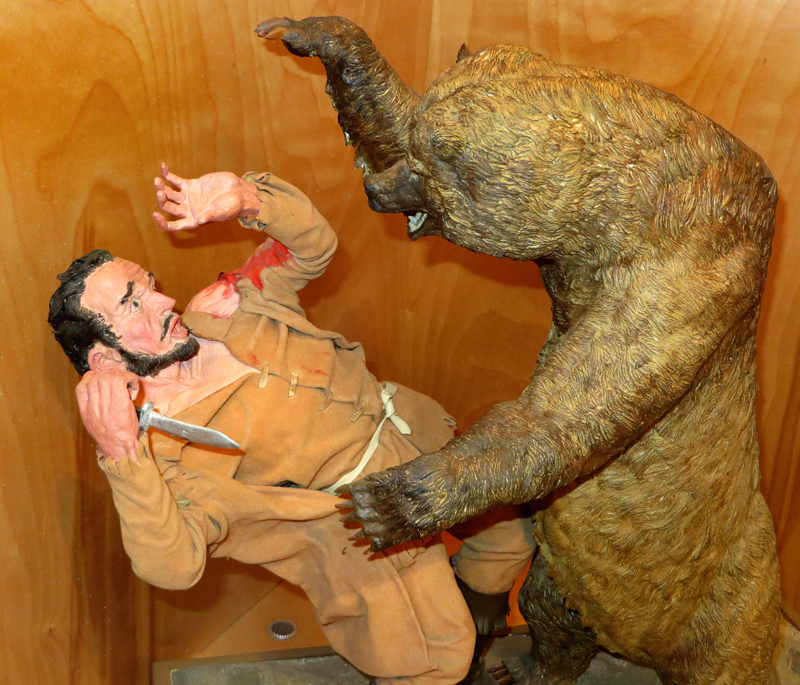 Artist's interpretation of the fatal mauling of Peter Lebeck. Sculpture on display in the Visitors Center at Fort Tejon State Historic Park. The remains were of a man approximately 6 feet tall, who was missing his right forearm, both feet and left hand, along with two broken ribs on the left side, all consistent with a gruesome bear attack. The previous summer in 1889, the Rangers held an outing at Fort Tejon during which one of their members accidentally rediscovered the Lebeck inscription after stripping away the overlying bark. The entire inscription was found in raised letters on the inside of the new bark along with the original inscription in incised letters on the surface of the tree. So, who was Peter Lebeck? We can only speculate, as there is no definite proof of his real identity. Raymund Wood, in his book on Lebeck, surmises that Lebeck may have been a French-Canadian member or employee of the Hudson's Bay Co. who had received permission from California Gov. Juan B. Alvarado to hunt and trap in the canyons surrounding the southern San Joaquin Valley. There were many parties of fur trappers in the area in the 1830s, led by American mountain men such as Jedediah Smith and James O. Pattie, but most of the trapping in these outfits was done by French-Canadians. Wood concludes that all evidence of fur trappers in the area leads to the idea that Lebeck was probably on a fur-trapping expedition, most likely the one that left Fort Vancouver under the command of Michel La Framboise in the fall of 1837. The tree's inscription in English suggests that Lebeck was a member of an English trapping party such as the Hudson's Bay Co., rather than an independent hunter. Lebeck rests at the base of an old oak on the grounds of Fort Tejon. Click for more. The letters "IHS" on the inscription suggest Lebeck was likely a Catholic French-Canadian. IHS are the first three letters of "Jesus" as spelled by the Greeks and commonly seen on Catholic inscriptions. Catholic French-Canadians were often present at Fort Vancouver. Why do we think a grizzly bear killed Lebeck? After all, the inscription indicates only "A x BEAR." As it happens, the grizzly was often referred to as an "X bear" in California because the hair along its back and shoulders appeared to form the letter X. It might never happen in this area again. While the grizzly was extremely common in the Southern California mountains of the 1800s, none has been none found around here in many decades. But do watch out for the occasional black bear that still roams the mountains around Santa Clarita. The town of Lebec, of course, is named for this unfortunate soul who lost his life to the mighty grizzly in 1837. Lebeck might have been all but forgotten if not for an inscription placed on an old oak tree by his hunting companions. Currently on loan from the Kern County Historical Museum in Bakersfield, the Lebeck inscription on a portion of the bark can still be seen today at the Fort Tejon Visitors Center. Editor's note: As of October 2013, the bark is off display. 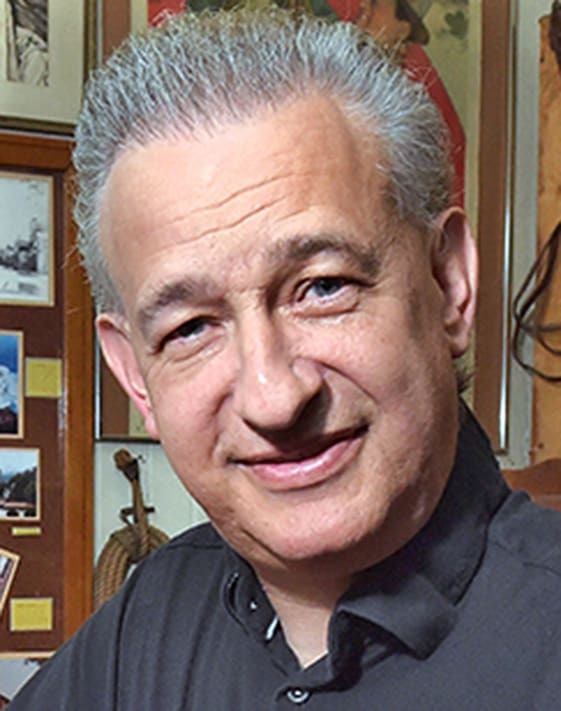 ©2009/2013 | Alan Pollack, M.D., is president of the Santa Clarita Valley Historical Society.